The issue is a common one with holiday fare: the film actively tries to mimic cartoons without bothering to learn what makes a good cartoon work. Sticking in zany sound effects and using cheap effects isn't enough to make a movie fun. Incorporating artifacts from animation into live action can be successful when done right (Elf jumps to mind as a good example), but you need strong writing, a carefully constructed tone, and good direction for it to work. Otherwise, you end up with something that feels cheap and cheesy. That's what happens here. Lacking even passable writing, this comes off as corny and worthless. There's a sense that each scene was designed to convey the cynical message, "This doesn't matter; it's just for kids." To that end, there are squeaky, farting reindeer, idiotic elves, and a pathetic villain. And, in the middle of it all, fifteen minutes hinting at how much better it actually could have been. 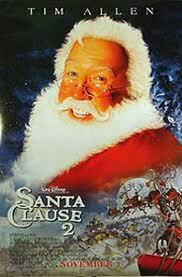 If you can't imagine how a movie about Santa Claus could be genuinely good, then you have no business making one.